A queen size that finishes at approximately 95″ x 94″. Heartfelt quilts are perfect for babies, newly weds (wedding gift!) and anyone that you want to have a beautiful, handmade reminder of your love for them. And while the Heartfelt quilt pattern can be used to sew sweet, traditional quilts, it can also create lively and modern quilts when made with bright, modern printed fabrics. This pattern also includes colouring sheets so you can audition all your colour ideas before you cut into your fabrics. The cover version of this quilt is made with Robert Kaufman Kona solids. The background fabric is Kona Snow, and the 5 heart colors are Cornflower, Astral, Chartreuse, Medium Pink and Bubble Gum. 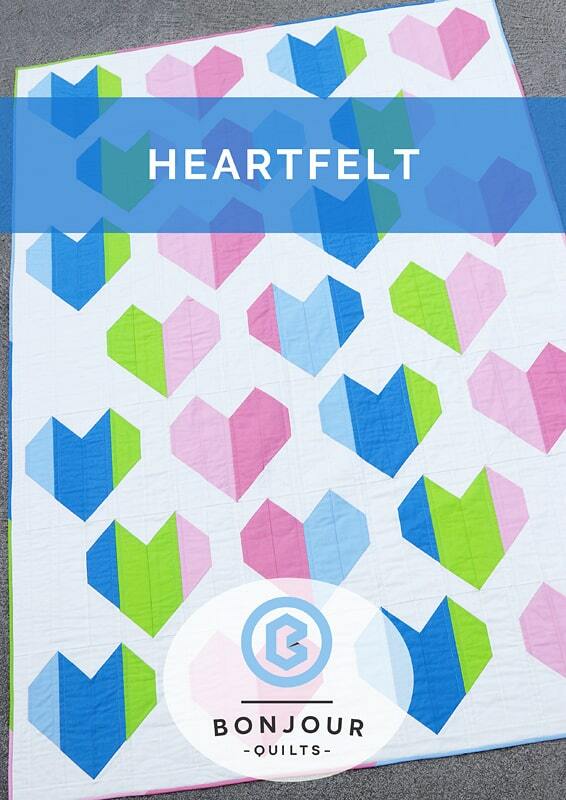 The Heartfelt quilt pattern will be emailed automatically to your inbox in the form of a downloadable link. You will be able to access the link three times before it times out – so make sure you save the pattern to your hard drive before then! If you have trouble saving to an iPad/iPhone (which is common), try saving to a laptop or desk top.